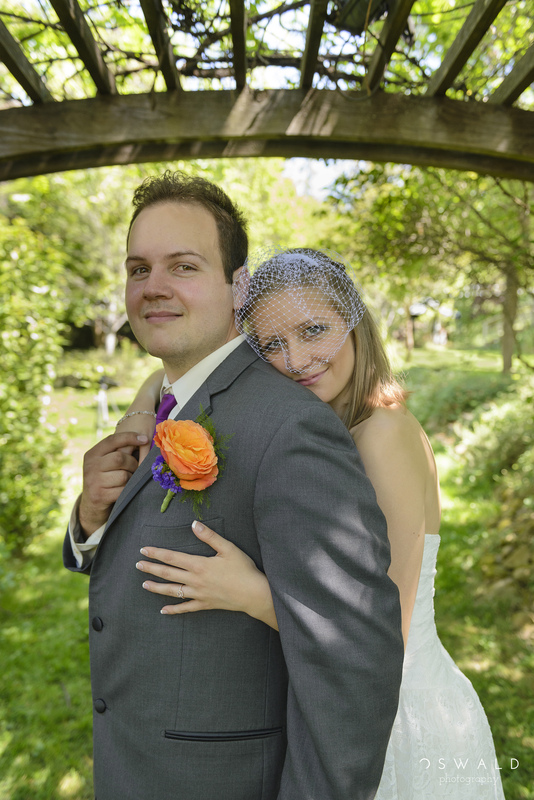 I was smack dab in the middle of my first day of wedding photography with my friends Justine and Joel. Their bridesmaids and groomsmen had spent the past few hours ensuring that the charming couple was dressed to the nines and ready for anything — like a few portrait shots before the ceremony. If they were nervous, I sure couldn’t tell. Probably because of my own raging nerves! It was as though spring had borrowed a day from summer, making for a particularly warm Sunday morning in April. You could tell from the growing buzz around The Park at Hanford Courte that today held something special. Loved ones filled the parking lot with their cars, stepping out to explore the lovely grounds before the coming ceremony. Gift bags soon covered the receiving table, and all sorts of video camera tripods stretched their legs out near the altar. Meanwhile, the bridal party and family busily made the sort of preparations that would continue up to the very last minute, even if only to do something with all that nervous energy. A tower of pizzas had to be tracked down. Purple and orange cupcakes needed setting out at each reception table. Justine and Joel, however, seemed to be in an entirely different world. Down in the terraced gardens, the lovebirds had escaped the hubbub and the heat under the shade of a wooden trellis. All of their attendants were otherwise occupied, and they had a moment to be with nobody other than each other. And me, I suppose. As I scoped out some good angles for portraits the two held each other — and held hands. They calmed each other with the quiet words and simple glances that only those deeply in love could offer and receive. “Ready for a few shots?”, I interrupted. I knew that there was less than an hour before the ceremony would begin and there were more memories to capture. And yet I don’t believe Justine and Joel shared my sense of urgency. Their own serenity began to slow me into an unexpected calm as well. If the bride and groom weren’t worried, why should I be? After all, most weddings don’t begin until the lady in white and her main squeeze appear. … shortly before stuffing the couple and my co-shooter Melissa into my car for a final photo shoot in downtown Sutter Creek. I was still hot and running on adrenaline, but I was no longer worried. Indeed, the rest of this day would be a blessing and a treasure. Thanks for teaching me something about calm on your big day, Justine and Joel! See? There are plenty of non-bridezilla brides. Who was a couple who showed their class all the way through their wedding day? Share in the comments below! You’re too kind, my friend. Thanks again to you both for taking a chance on me!